They're soft, fluffy, dense and moist all at the same time. 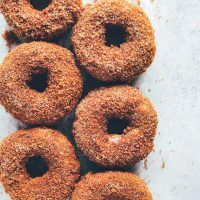 The outside is coated in a sticky delicious mix of brown sugar, coconut sugar, regular sugar, cinnamon, and a dash of pumpkin spice. So Good! Preheat oven to 375F and spray doughnut pan with non stick cooking spray. In another bowl whisk together all wet ingredients fold in wet to dry until mixed in well. You may have to use your hands to almost knead the dough a little bit and make sure all the flour is incorporated. Put dough into a large pastry bag with a large hole cut off at the tip (or zip lock bag cutting off a large piece of the corner) and pipe dough into doughnut pan. Wet your fingers to smooth out the tops of each doughnut. Place in the oven and bake for 12 minutes. Ovens vary so if it needs a couple more minutes that's fine but 12 is perfect for me. When done let cool for 10 minutes before coating. Have your melted butter and sugary coating ready. Mix the sugars and spices together one bowl and have the butter in another. Submerge each doughnut into the melted butter then into the sugary coating making sure all sides are covered. Repeat this till all doughnuts are covered. Serve with your fave milk, tea or coffee and Enjoy! Store in an air tight container at room temp or in the fridge. To make a glaze use 1 cup organic powdered sugar to 3 tbsp almond milk and 1/2 tsp vanilla extract. For a thinner glaze add more milk for a thicker glaze add as little milk as possible. I start with 3 tbsp and take it from there!